One girl, ten nails and a million nail polishes…. 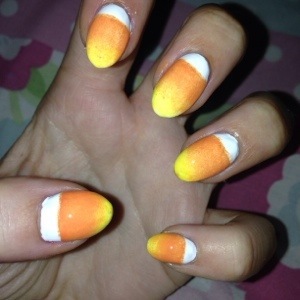 For day 4 of the nailart challenge the theme was candy corn, so I firstly painted my nails with OPI’s ‘Alpine Snow’. Then when they were dry I decided to sponge on the orange and yellow polish, OPI’s ‘In My Back Pocket’ and ‘Need Sunglasses?’, using a makeup sponge as you would a gradient effect. Then I topped them all off with Seche Vite Fast Drying Topcoat. I did this mani at the very beginning of October for the Nail art challenge on instagram and the theme was gold. So I decided to do some tuxedo and bow tie nails. Firstly I painted my ring finger with OPI’s ‘Oy Another Polish Joke’ and the rest of them with ‘Lincoln Park After Dark’. I then used a small detailing paintbrush and Lincoln to create the tuxedo and undone bow tie accent nail. 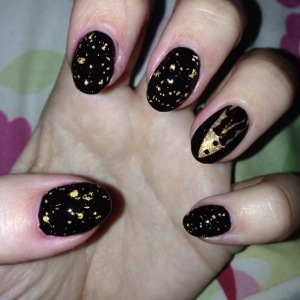 Then I topped the rest of my nails with OPI’s 18k Gold leaf topcoat ‘The Man With The Golden Gun’ and some Seche Vite.